With our integrated tube production facilities, we are capable of offering high quality Admiralty Brass Tubes that are apt for various applications in evaporator & cooler industry applications. These Admiralty Brass Tubes possess all essential properties such as versatility, corrosion resistance, high thermal conductivity, easy to join and install, capable of providing problem-free performance and easily maintenance. 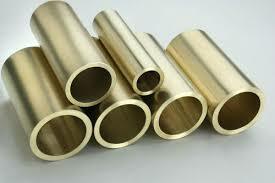 These Admiralty Brass tubes are extensively used in various applications including; evaporators, condensate coolers, heaters, vent condensers, water heaters, generator, air coolers, turbine oil coolers for petrochemical, ship-building, power plants, desalinations plants etc. Available in a variety of tempers as per the requirements.